New York University's College of Dentistry collected data in 2010 from a male patient who reported extremely sensitive teeth, dark staining, and rapid enamel loss during the five-month period he began a 90-minute swimming routine in his backyard pool. 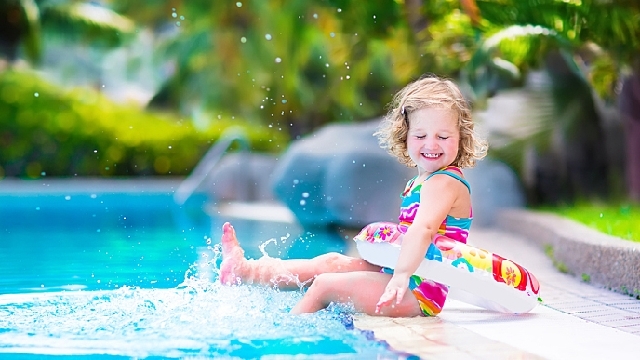 Having found improper chlorination to be the cause of his enamel erosion, Dr. Leila Jahangiri, who authored the report, noted that pool water does become a threat to your teeth when its pH level falls below 7. When in a public pool or on a tropical vacation, take notice of pool linings, railings, and ladders. Pool water that's too acidic will eat away at these surfaces. If you notice spots of erosion, the water may do the same to your teeth, so consider skipping your swim or pursuing a natural (but supervised) body of water. Pool pH strips are also common to local recreational supply stores, and allow you to test the water before wading in. According to the CDC, pool water should register between 7.2 and 7.8 on the pH scale.